Chandon Williams enjoys taking a multi-faceted approach to holistic living and her vitality comes from practicing what she preaches. Acupuncture with Chandon is tailored to your needs and may also include holistic lifestyle coaching, nutritional counseling, herbal medicine and facial rejuvenation. She is committed to helping others achieve optimal health and gives simple yet effective recommendations to help her clients reach this goal. Click here to view an interview with Chandon Williams. Chandon Williams enjoys working with people who are looking to improve multiple aspects of their lives and are committed to doing the work needed to transform. She offers support and knowledge backed by years of experience to help her clients on their way to optimal health. Regardless of why they are coming, her clients find themselves motivated, eager to learn and committed to their whole health: emotional, physical and spiritual. 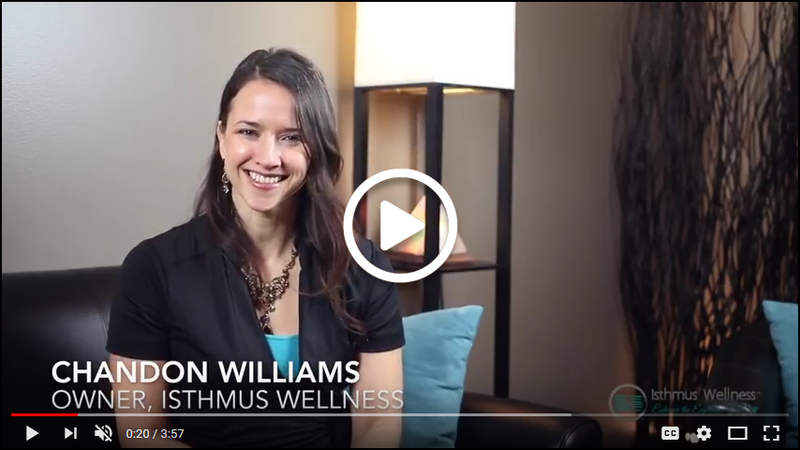 Chandon Williams was instrumental in starting Isthmus Wellness in 2005 and enjoys working in an environment that offers many modalities to synergistically support clients’ health and wellness. Chandon created the Acupressure for Birth Partners training offered at Isthmus. Chandon Williams graduated in 2007 with a Master of Science in Oriental Medicine from the Midwest College of Oriental Medicine and as a massage therapist from The East-West Healing Arts Institute in 2005. Chandon has studied extensively under world-renowned facial acupuncturist Mary Elizabeth Wakefield. She is nationally board certified by the National Certification Commission for Acupuncture & Oriental Medicine (NCCAOM). Chandon also studied Arvigo Techniques of Maya Abdominal Therapy™. Click here to read Chandon’s testimonials.